Many of my team mates are in tournament mode here as it is tournament season with the second "Grand Prix" qualifier happening this Saturday. I am not competing as my head is just not in it with my new born and toddler taking up the vast majority of my time; but I am still progressing in general, which is fine by me. I did get to act as chum for one of the big sharks of our club, Sam Osman, last night and thought I would share some thoughts. Our class, traditionally before a tournament has a pre-tournament show where Professor plays ref and we have formal scored matches in front of the class. They are fun to watch and you get a little bit of that competition feeling because you are put on stage. It is great preparation for the tournament to get a feel for what a real match feels like. Firstly, almost all matches I watched were tense and explosive. Tense and explosive. I suspect that for many of the first time competitors, their main opponent will be themselves and burning out too quickly. That is something that will be remedied over time. In my match with Sam I felt that I lacked any explosiveness and made some very critical mistakes like escaping and putting myself into Sam's Guard, not staying on my feet longer, and playing defense too much rather than attempting proper attacks. However, the mistakes are a drop in the had as Sam has superior skill, size, and experience. And I am fully comfortable with getting a whipping from him, as long as I try my best; he is a worthy mentor. One thing learned though; do not pause once hit the ground on a take down. Whether you were taken down or took down your opponent, be active as soon as possible and fight for the dominant position. A fraction of a second pause can put you in a bad position. And being on offense is far better than being on defense. P.S. Good luck to Team Schilling on Saturday! Sometimes you don't know it until IT bites you. A few weeks ago I was in a roll with a pretty slick fighter with good mobility. He got mount and I was unable to upa or bump him off, well for a little while. I found myself pushing him up and off me, straightening my arms in the process to make space giving him ample opportunity to arm bar me. A beginner white belt mistake. After class, Professor pulled me aside asked me to take top mount on him. He escaped like butter. I mounted high on his chest, got my hooks in from a low position, postured up from a middle position and pressed down on his hips; each time nothing would stop him from escaping with simplicity. He then mounted me and asked me to escape. I was tired after the rolls, but that is no excuse; my mount escapes were weak, useless, and almost non existent. I love my Upa, but that only works when the conditions are in line. 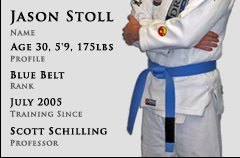 Professor then told me that someone who can not escape from mount should not have a blue belt around their waist. I agreed. I was embarrassed and ashamed that there was such a gaping hole in my game. But it was what it was and needed to be fixed. So for the past month or so, every roll I start mount bottom and am at the point where I can now escape in a few seconds using some tools Professor taught me, as well as my Upa when available. I am still improving my sneaky knees and shrimps to become even more effective with my escapes. There are so many positions and options in Brazilian Jiu Jitsu. It takes a long time to be proficient in all of them. But a good instructor, like my Professor, will tell you what to fix quick, what to work on, and which way to go. It may not be pleasant to hear sometimes, but deal with the information without ego and do what he says; he really does know what is best when it comes to your development. I am a better player for it.